I have been making this sauce for over 25 years now. Many people tell me that it is the best BBQ sauce they have ever had. Many say that they have never liked barbeque sauce until they tried Ol' West. Often they re-order by the case! This sauce is great on chicken, pork, beef, ribs, steaks, chops, burgers, meatloaf, baked beans, spaghetti, fries, deer and even salads. It is thick and does not "run off" food when cooking. It is an excellent "dipping sauce" for many foods including shrimp and onion rings. Try a bottle - you'll be glad you did. 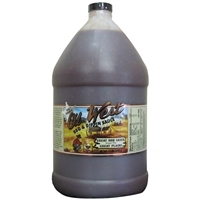 Ol' West is a blend of great barbeque flavors - not a mass produced bottle of vinegar, corn syrup and tomato paste that has flooded the grocery shelves for years. I have been making this sauce for over 25 years now. Many people tell me that it is the best BBQ sauce they have ever had. Many say that they have never liked barbeque sauce until they tried Ol' West. Often they re-order by the case! This sauce is great on chicken, pork, beef, ribs, steaks, chops, burgers, meatloaf, baked beans, spaghetti, fries, deer and even salads. It is thick and does not "run off" food when cooking. It is an excellent "dipping sauce" for many foods including shrimp and onion rings. Try a bottle - you'll be glad you did. 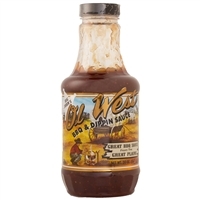 Ol' West is a blend of great barbeque flavors - not a mass produced bottle of vinegar, corn syrup and tomato paste that has flooded the grocery shelves for years.